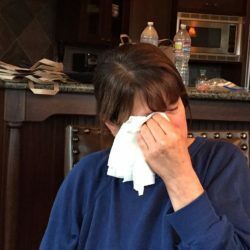 It’s hard to believe 2016 has already come and gone. How time flies! Starting off the New Year to many means a fresh start – healthier eating, lifestyle changes to incorporate more exercising, establishing new friendships, and to improve life overall making whatever changes you feel necessary. Of course by the end of 2017 some of those goals may have gone by the wayside – having goals though is paramount when it comes to achieving a specific outcome. Only you can determine what you want to accomplish in 2017, and as long as you’re in the drivers seat (not someone else) you’ve got a great start! If healthy eating is one of your goals for the New Year then you’ll love the recipe I’m sharing today. Breakfast is my all time favorite meal of the day. I don’t recall ever missing a morning of breakfast even when all my friends in high school would skip it claiming it helped them to lose weight. For me it revved up my engine making me feel energized, and clearing my mind so I could plow forward with my day. Of course breakfast in my opinion can be served anytime of day just like any other meal, except probably sugary desserts that can drag you down. 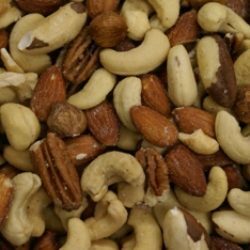 So think sensibly when fueling your body, selecting ingredients with enough nutrients to sustain you through the morning, afternoon, or evening so you won’t feel the need to grab unhealthy snacks. 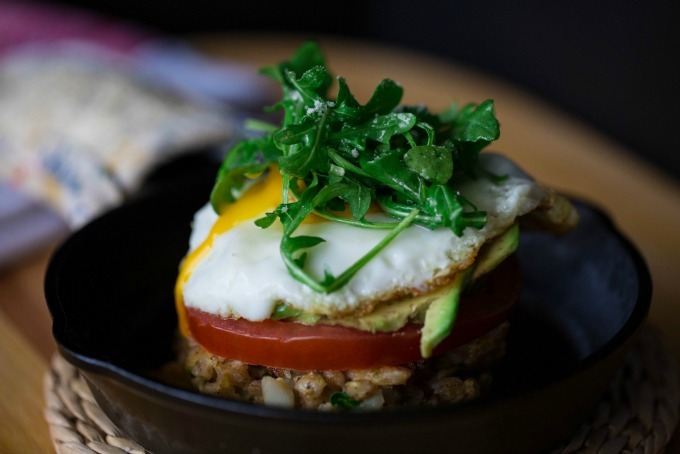 This Farro Cake with Tomato, Avocado, Egg, and Arugula Salad hits the spot for breakfast, lunch or dinner. What I love about it is you can prepare the Farro a day ahead adding the egg for binding just before placing in the skillet. Have the lemon vinaigrette prepared so all you need to do is add a drizzle to the Arugula, and toss. 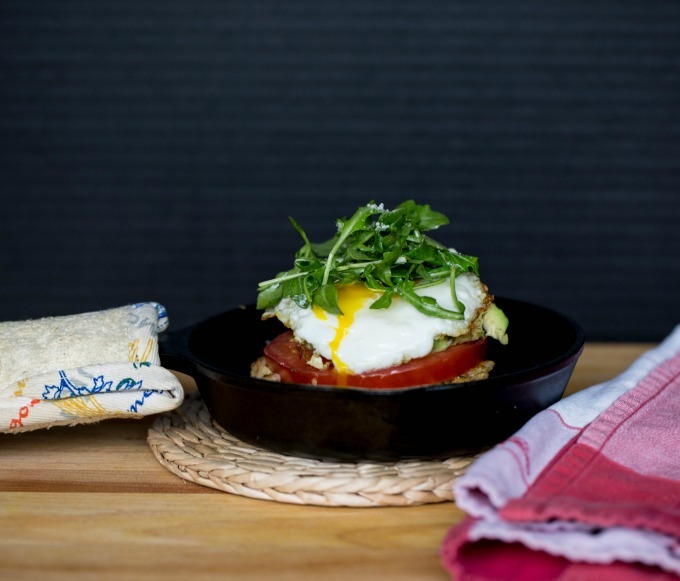 The rest is simple – slice the tomato, avocado, and fry the egg, then layer, and serve this towering masterpiece! I love using these little cast iron pans by Lodge. They stack nicely in my cabinet and are ready whenever I want to create individual servings. Use them for breakfast, lunch, dinner, or even for individual desserts dishes. Plus they can go from the stove top to oven and table – just be sure to place a hot pad underneath the skillet prior to setting it on a table. How fun is that! If you’re not familiar with Farro the Ancient Grain, head over to the post for my Farro and Arugula Salad to get the 411 on this healthy grain. Avocados are incredibly nutritious containing more than 20 different vitamins and minerals! Unlike other fruits that are high in carbohydrates, avocados are high in healthy fats. Avocados are loaded with heart-healthy monunsaturated fatty acids – but they don’t just contain any fat… the majority of the fat in avocado is oleic acid. Avocados are loaded with fiber. People who eat avocados tend to be healthier. The fat in avocados can help you absorb nutrients from plant foods. Avocados are loaded with powerful antioxidants that can protect the eyes. Avocados may help prevent Cancer. Avocado extract may help relieve symptoms of arthritis. There’s some evidence that eating avocados may help you lose weight. 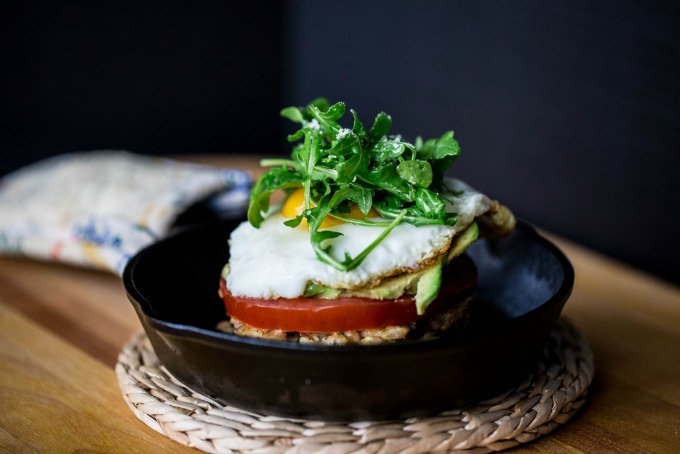 In addition to the Avocado, a nice thick slice of a fresh tomato offers a myriad of health benefits as well as the sunny side up egg and arugula salad, making my Farro Cake stack a meal you won’t want to miss! Serve straight from the skillet for a fun, rustic, and healthy meal! 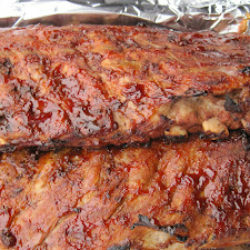 I know you’re going to love this recipe!!! This nutritious meal that's packed with flavor and health benefits will have you craving it for Breakfast, Lunch, and Dinner! Cook Farro according to package directions. While Farro is cooking combine thyme, onions, chopped arugula, garlic, Parmesan, breadcrumbs, pepper, and whisked egg to a medium size bowl and blend. Once Farro is cooked and has absorbed all the liquid add to the seasoned mix, and stir to combine. Add butter and oil to skillet. With a 1/2 cup measuring scoop add Farro mixture into patties and fry on each side until brown. In a separate skillet prepare 4 individual sunny side up eggs or if preferred over easy eggs. Salad Dressing: Make dressing by squeezing the juice of one lemon into a small bowl, then whisking in olive oil to taste until you get the right balance. Add honey to taste, and emulsify. Store in a jar and set aside until ready to use. 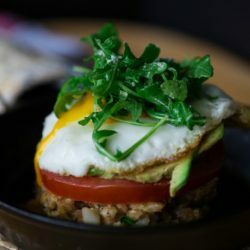 Layer: In each skillet or on individual plates layer in this manner: Place Farro Cake on the plate, top with one sliced tomato, avocado slices to cover tomato, egg, and arugula salad. Sprinkle arugula lightly with Parmesan cheese. Serve. This sounds absolutely delicious! Alone having arugola on it, makes it for me! Thanks for sharing! It was delicious and totally satisfying. I hope you enjoy it if you make it. Thanks for your reply. This looks wonderful! We love farro, avocado – and a quick-to-make meal. If making for a dinner I’d try with a gremolata olive oil I got in Italy – so good! Hoping to make this over next few days. Thanks Maria. I love the sound of your gremolata olive oil, it sounds perfect! Let me know how you like it if you try it. Happy New Year! I love this kind of breakfast, it looks delicious and definitely not ho-hum. This would be good for breakfast, lunch, or dinner. Great dish. And yes, after the holidays we definitely need healthier eats. Thanks for this. Have never cooked with farro before, in fact, I don’t think I’ve ever eaten it before. What a great recipe to introduce us to farro. Thanks! Beautiful presentation and wholesome stack, Vicki. I love this kind of breakfast. Thank you for the recipe. 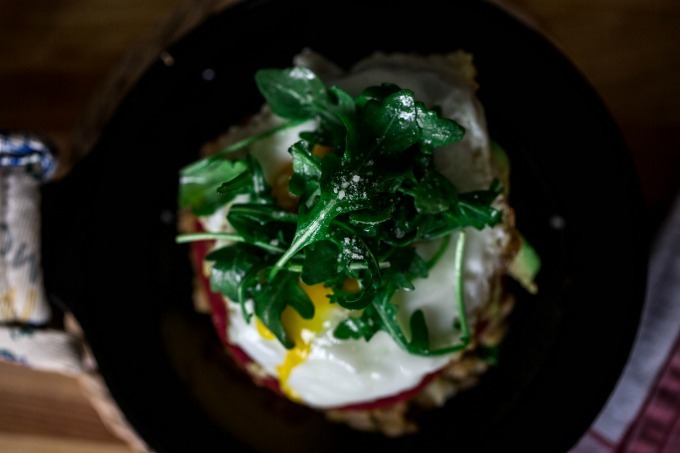 I love the idea of making farro cakes! Perfect base for all sorts of different toppings but I’m loving your breakfast stack! I love farro and I love this dish. It’s not often one finds smething that works for breakfast lunch and dinner, but I believe yu have succeeded! 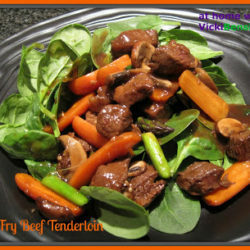 Made this for dinner tonight – so good! I fried up extra farro cakes to freeze for next time. I did sauté the shallot and garlic before adding to the farro mixture because I didn’t want to risk a raw taste. The gremolata was good but I think it was a little drowned out by the bold flavors in the layered “tower.” Or maybe I didn’t drizzle enough on – watching the calories these days! I will try your lemon dressing next time.